Welcome to part 2 of my Trip report. 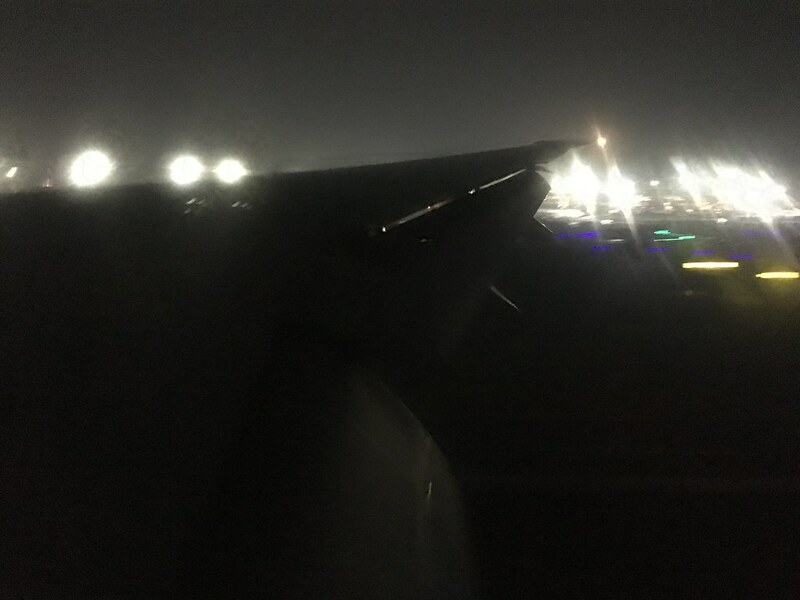 I had just disembarked from DL 134 after a 7-hour flight from Detroit. We had arrived 30 minutes behind schedule due to a delay in departure from Detroit. 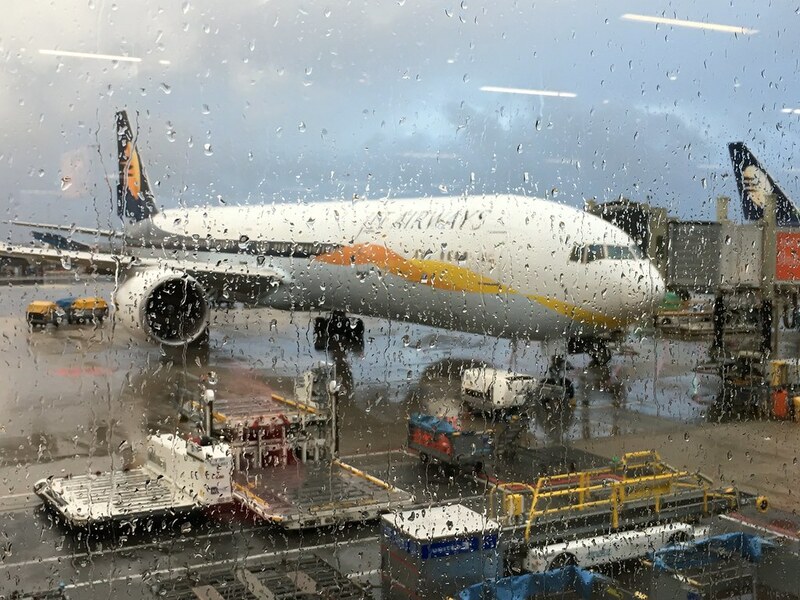 I had around 3 hours to go for my upcoming flight on the trip 9W 231 to Mumbai, with Jet Airways. After a brief visit to the restroom close to the arrival gate in concourse D, I went looking for a Flight Information Display screen as I didn't have a Gate number printed on my boarding pass. 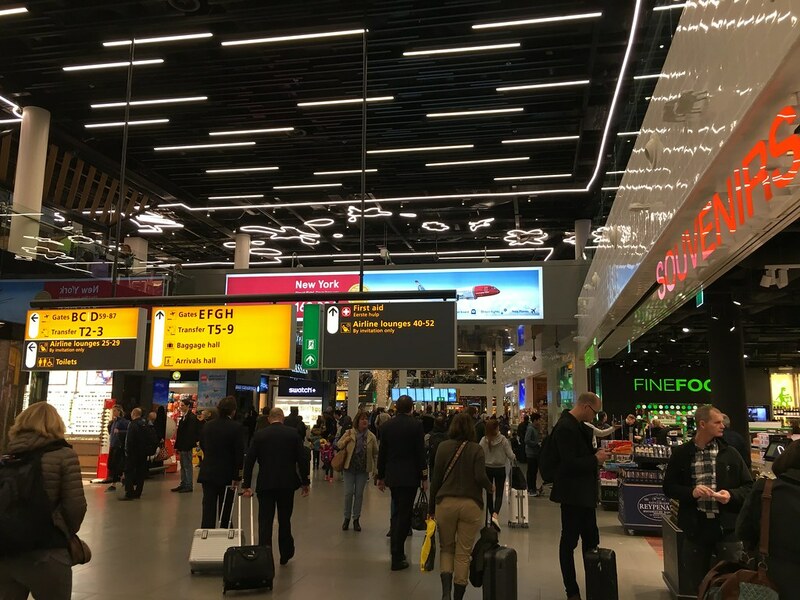 The first one I found told me that my flight to Mumbai would board from Gate G4 in concourse G. Amsterdam airport had some lovely decorations for the holiday season. 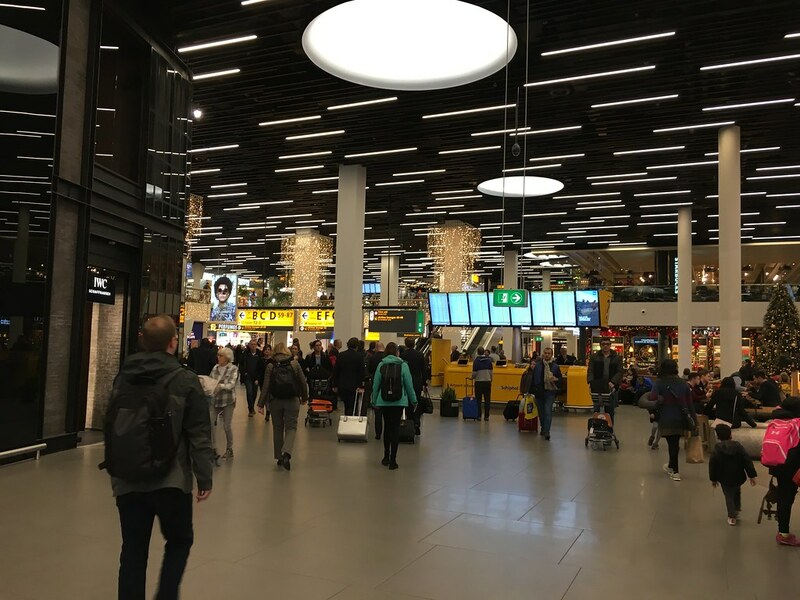 With only one (large) terminal, the connection was extremely convenient, as there was no need to take a bus/train between concourses. Interestingly, there was no transfer security or passport check while I was transferring to my flight to India. I am unsure if this holds true for someone traveling to the US via Schiphol. After a fairly long 20 minute walk, I was at Gate G4. 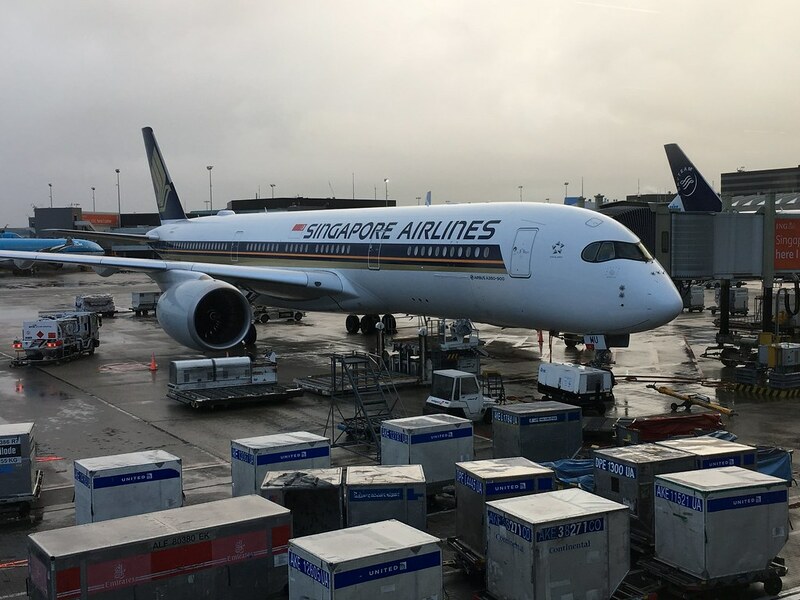 Concourse G was dominated by flights serving Asian destinations, such as the Garuda Indonesia service to Jakarta on a Boeing 777-300ER, Singapore Airlines' service to Singapore on the A350-900 and 4 flights operated by Jet Airways to Delhi, Mumbai (both B77Ws), Bangalore (A333) and Toronto (B77W), the only non-Asian destination from this concourse at the time. 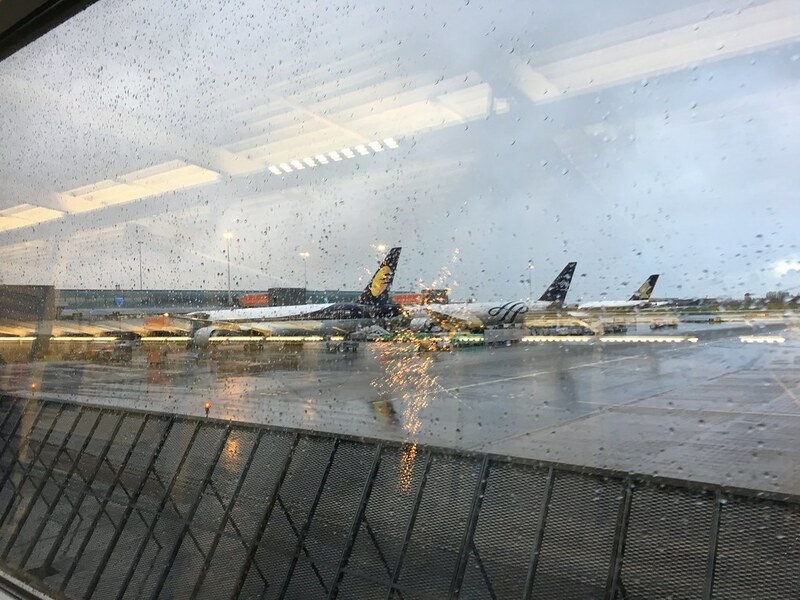 The Jet Airways flight to Bangalore would have been ideal, except that it was significantly cheaper to fly via Mumbai. I had to fill my growling stomach with something more than the frugal breakfast that Delta served. I bought myself a croissant and a banana from a store near Gate G4. 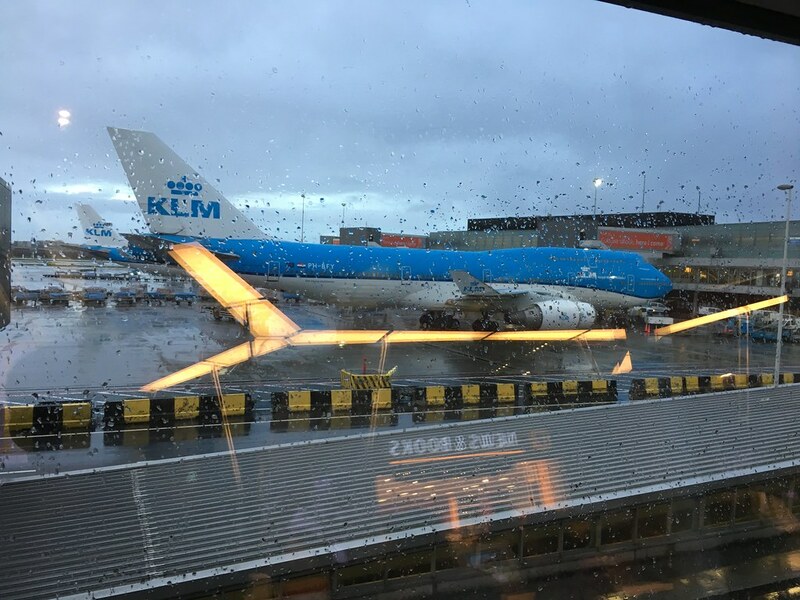 As I finished my breakfast at the Gate, a KLM agent checked boarding passes and passports of those booked on the Mumbai flight. 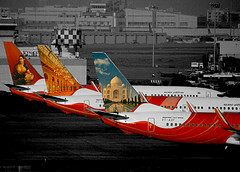 At 10:15 am, boarding for 9W231 to Mumbai was announced. 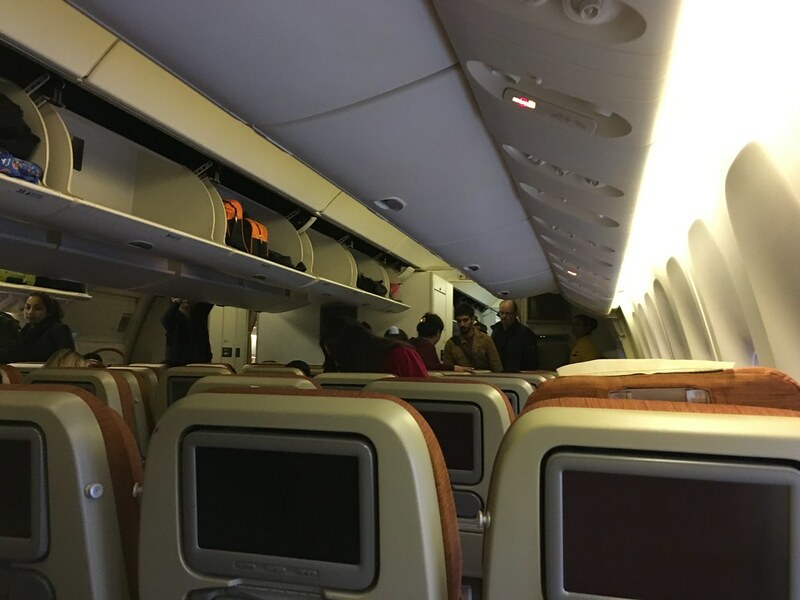 Passengers needing wheelchair assistance boarded the aircraft first. Boarding for Economy class was done zone-wise, starting off with Zone 4. I boarded with the passengers seated in Zone 3. As I made my way through the Jetbridge, the cockpit crew for the flight arrived. I occupied seat 37K at 10:45 am. 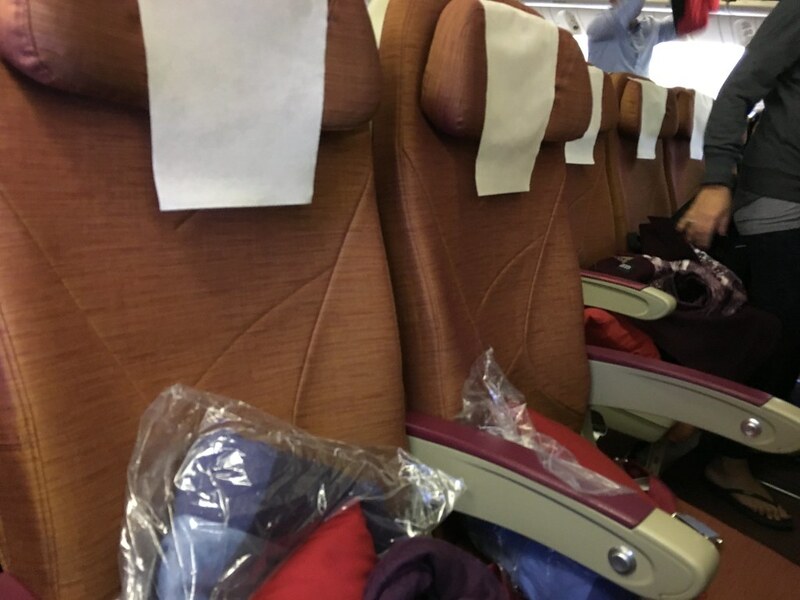 The seats on the Jet Airways' Boeing 777 in Economy were laid out in a 3-4-3 configuration. Legroom was okay on most seats. 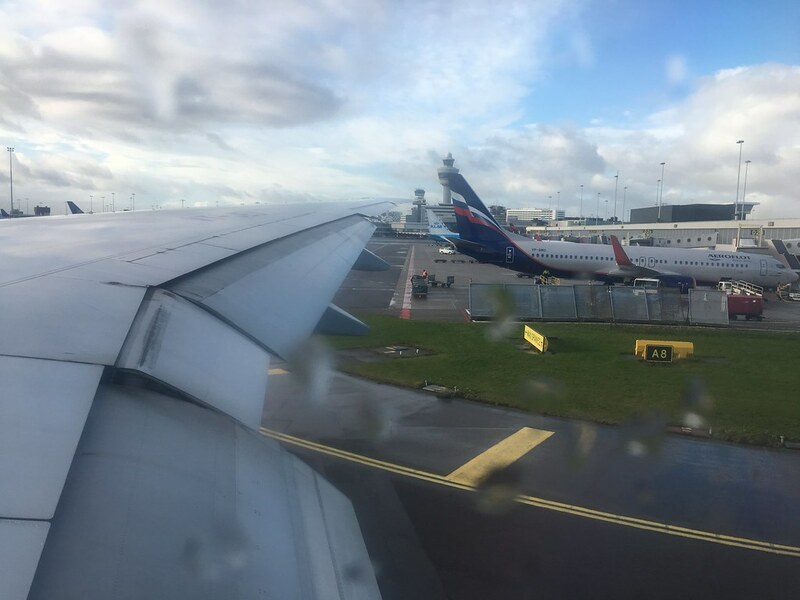 The window seat, however, was quite uncomfortable as the IFE equipment occupied a significant amount of room. A long flight only makes this worse. Around 15 minutes past 11 am, we received our pre-flight brief from the flight deck. Captain G.D. Tripathi was in command of 9W 231, with first officers Pradip Das and Sunil Bhat assisting him. We would reach Mumbai in 8 hours. 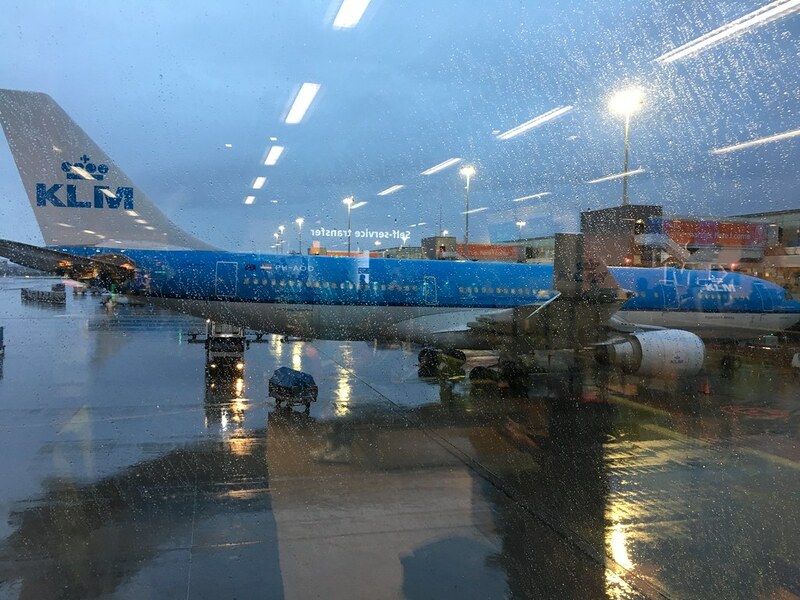 We were told to expect a 30-minute delay in departure due to congestion in Amsterdam. 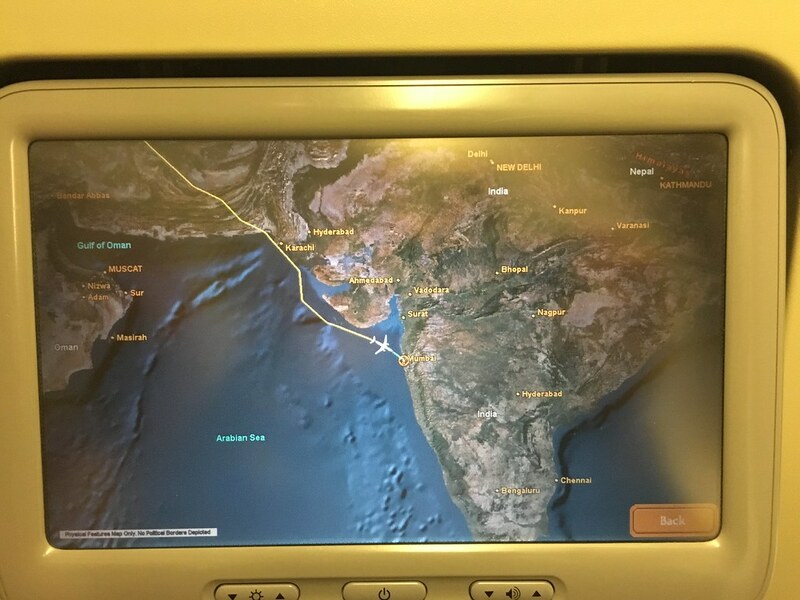 This would not affect our arrival in Mumbai as we had some strong tailwinds en-route. 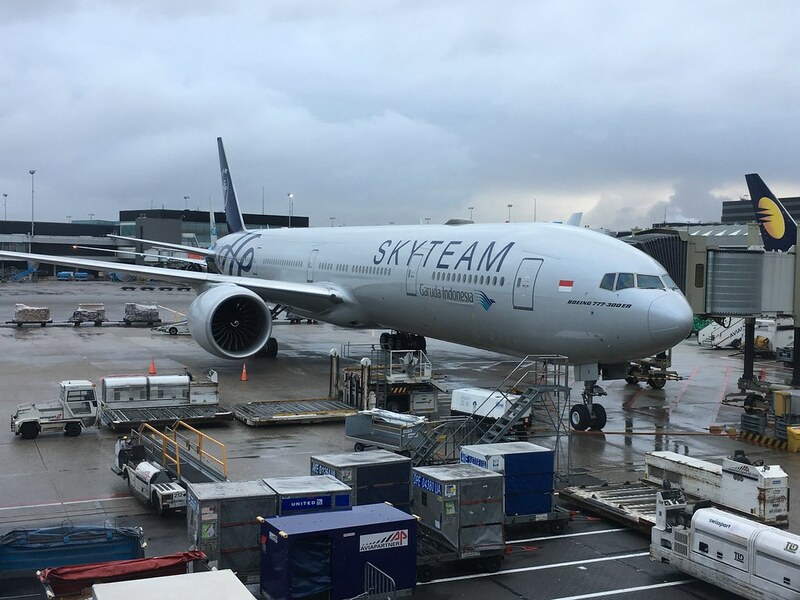 As Captain Tripathi was making his announcement, the Garuda Indonesia B777 in the neighboring gate started her engines for the flight to Jakarta. 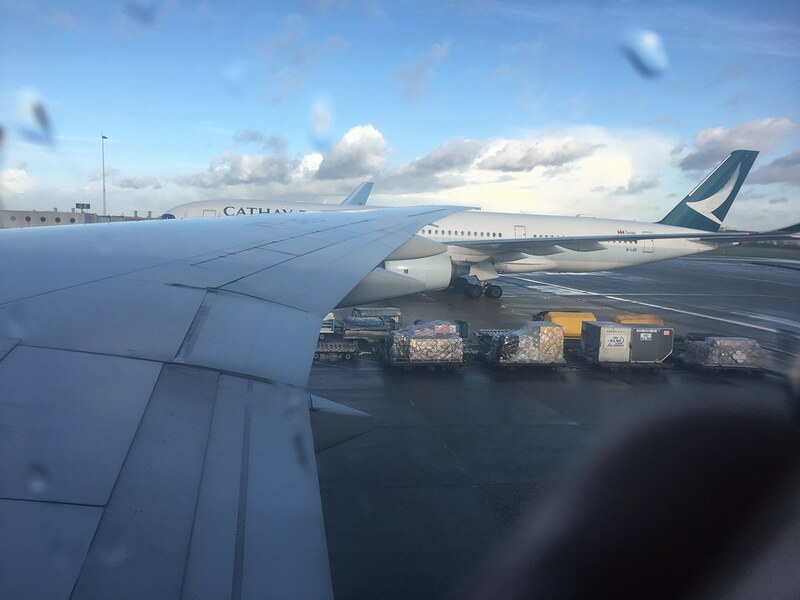 A Cathay Pacific A350 subsequently occupied this vacant gate. We pushed back from G4 at 11:58 CET. 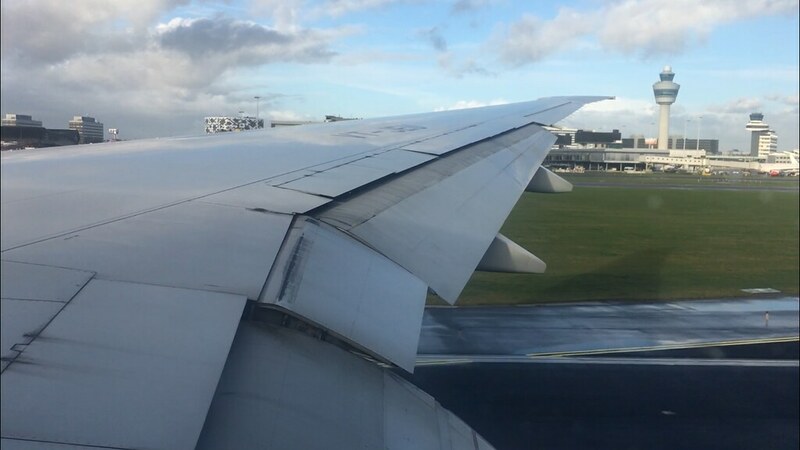 Unlike my previous flight, this Boeing 777 was powered by General Electric GE-90 engines, known for being loud. The engines sent huge vibrations through the cabin when they were turned on. It was a 15-minute taxi to Runway 24. A Jet Airways Airbus A330-300 was just ahead of us on the taxiway. 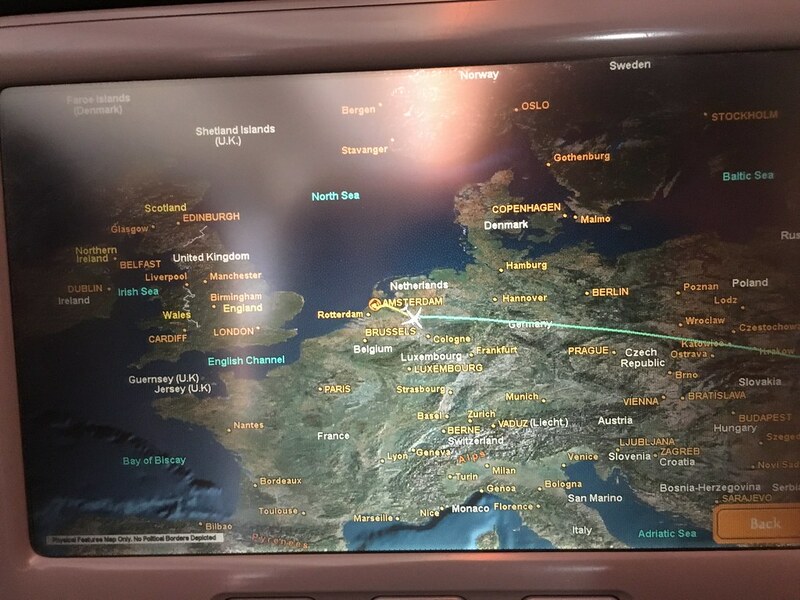 We took off from Runway 24 at 12:15 CET heading west by southwest. 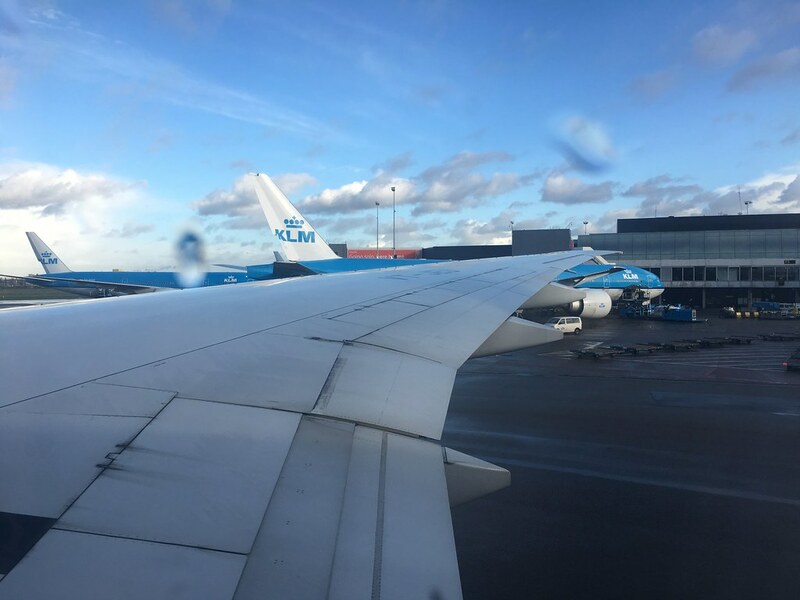 The skies over Amsterdam had cleared up and we continued our smooth climb to FL310. 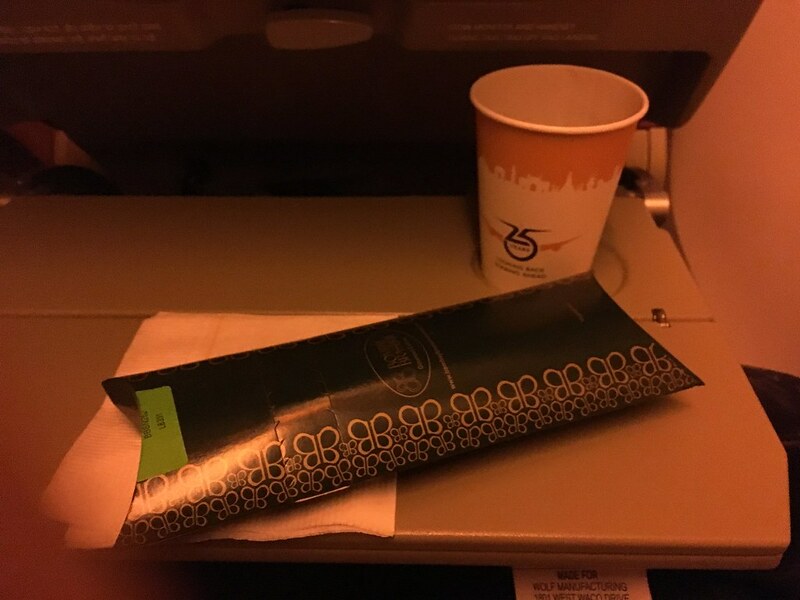 After the seatbelt signs were turned off, the cabin crew started the drinks service. I tried tomato juice with pepper this time, but didn't find it too appealing. I still prefer hot tomato soup with pepper. Around an hour later, the lunch cart finally made it's way to my row. I chose the vegetarian option. 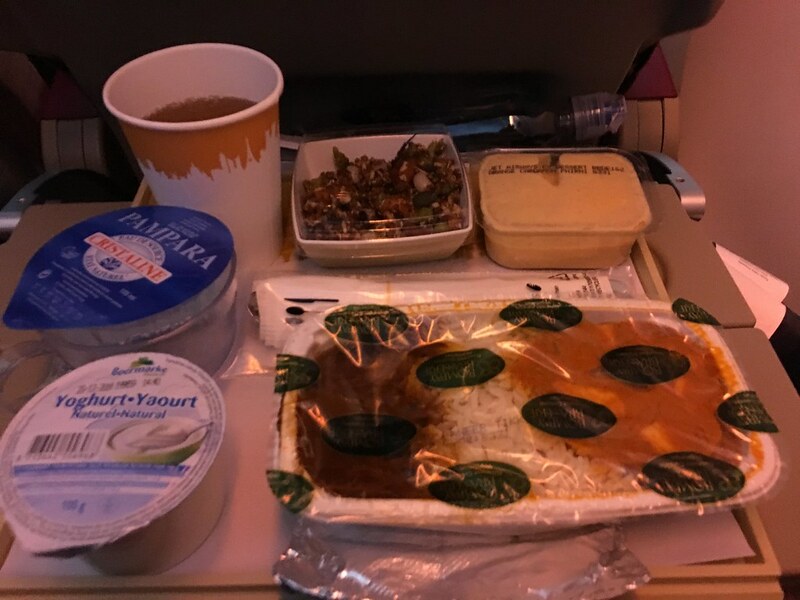 The tray included a salad with sprouts, cucumber and tomatoes, plain yogurt, rice, rajma, paneer tikka masala with 2 parathas and cardamom flavored phirni. The food from Bombay Brasserie tasted really good. After lunch, I tried the JetScreen in-flight entertainment system. While the system was slightly older than the ones that you see on long flights, it boasted of a good collection on entertainment options in the form of music albums, movies and shows. 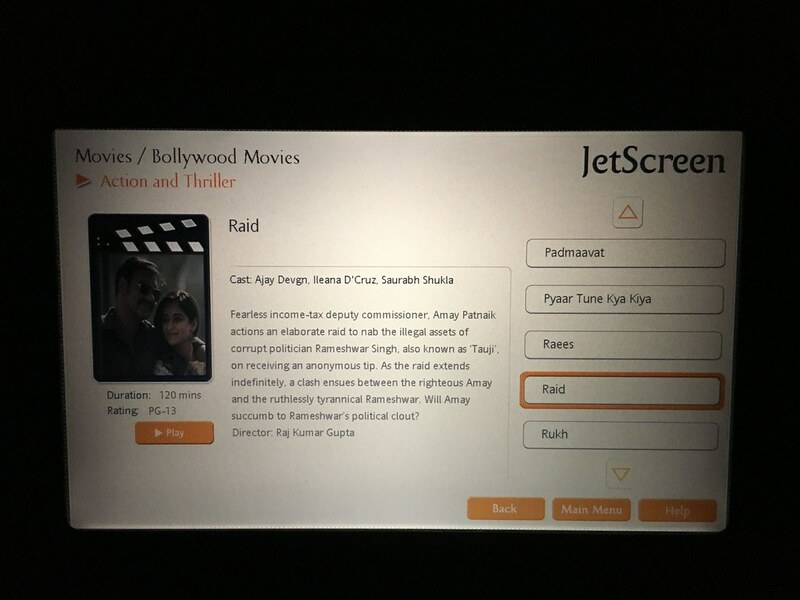 I settled for a Hindi movie "Raid", featuring Ajay Devgn. After this lovely movie, I decided to take a nap. 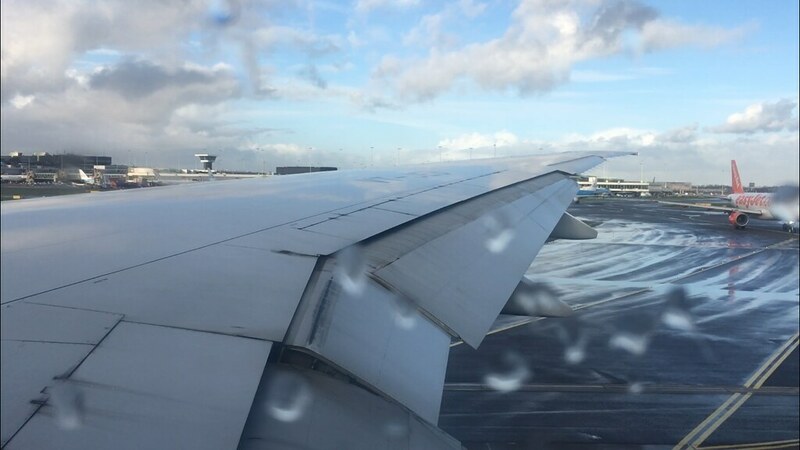 We were asked to close the window shades as many of the passengers were resting. 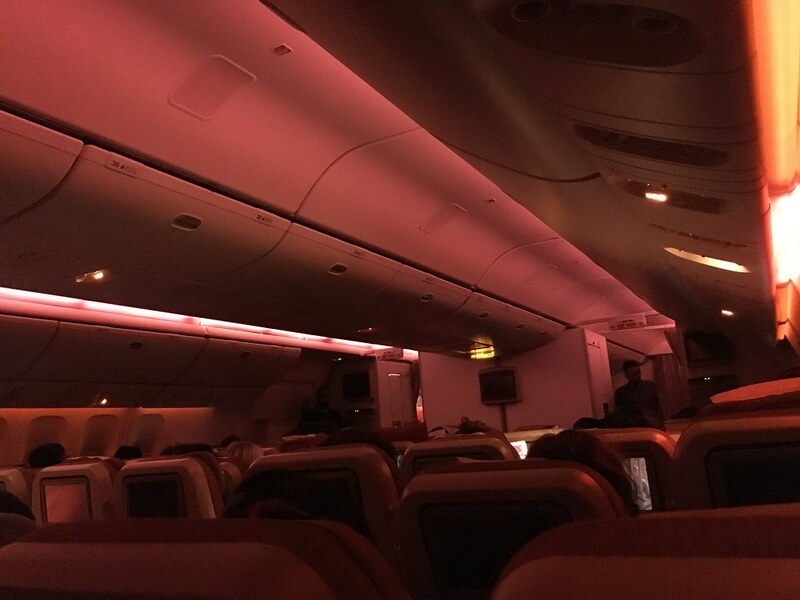 Mood-lighting was also turned on. Every now and then the flight attendants offered water/drinks to those passengers who were awake. 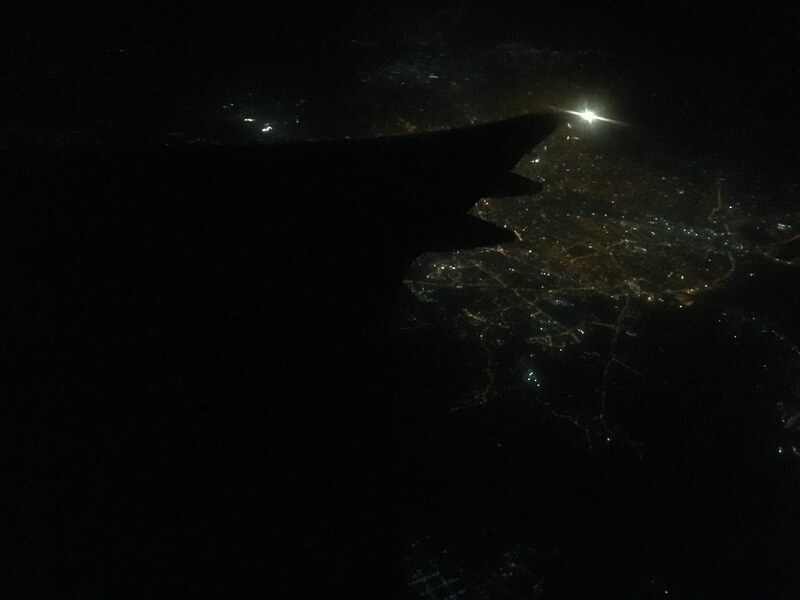 When I woke up we were flying over the Caspian Sea, close to Iran. I spent some time browsing the in-flight magazine and reading Sourav Ganguly's autobiography that I had got along as we continued our southeasterly course towards Mumbai. 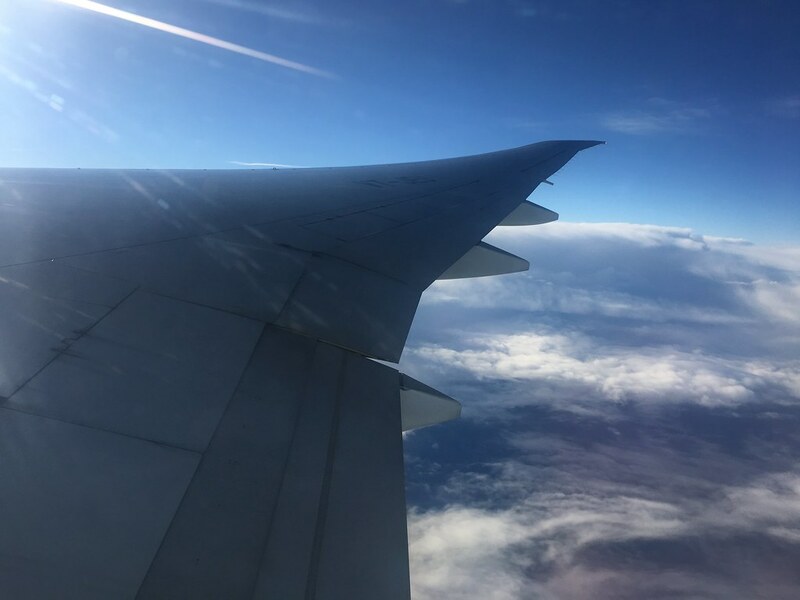 It was at this time I was starting to get a little fidgety, owing to the cramped 3-4-3 seating and the lack of legroom in the window seat. I used the small window of opportunity that was created when my co-passenger left his seat to use the restroom. Things were much better after I walked down the aisle a few times. 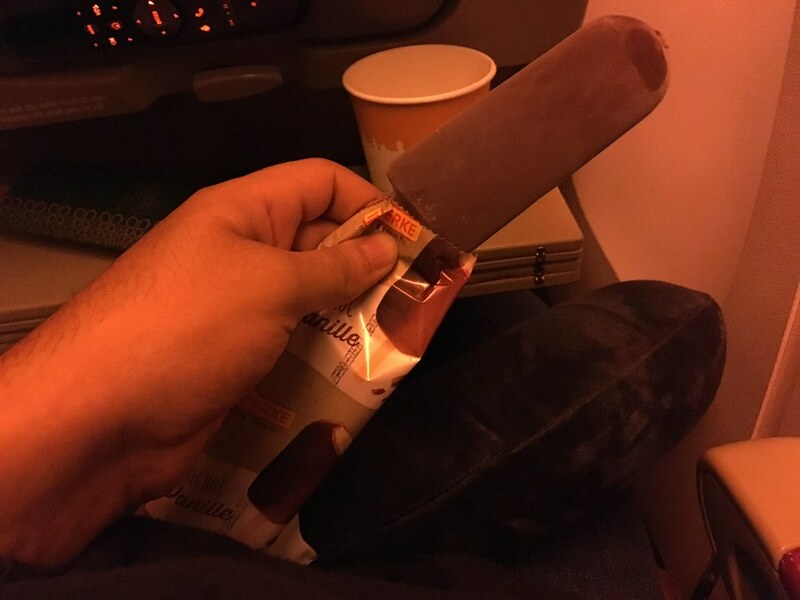 We were flying over the Arabian Sea when the Cabin Crew served us a snack, a vegetable roll with chocolate ice-cream. While this didn't taste as good as lunch, it was quite filling. 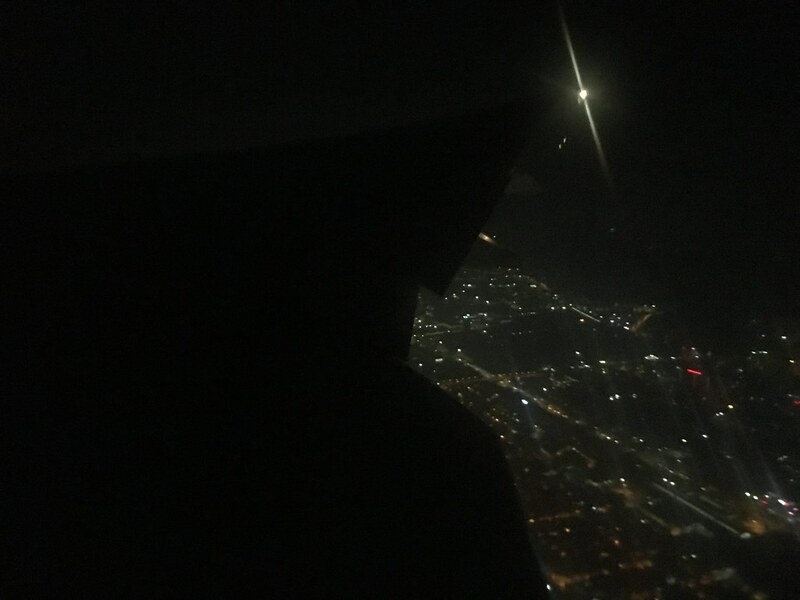 With around 30 minutes to go, the first officer informed us of our imminent arrival. 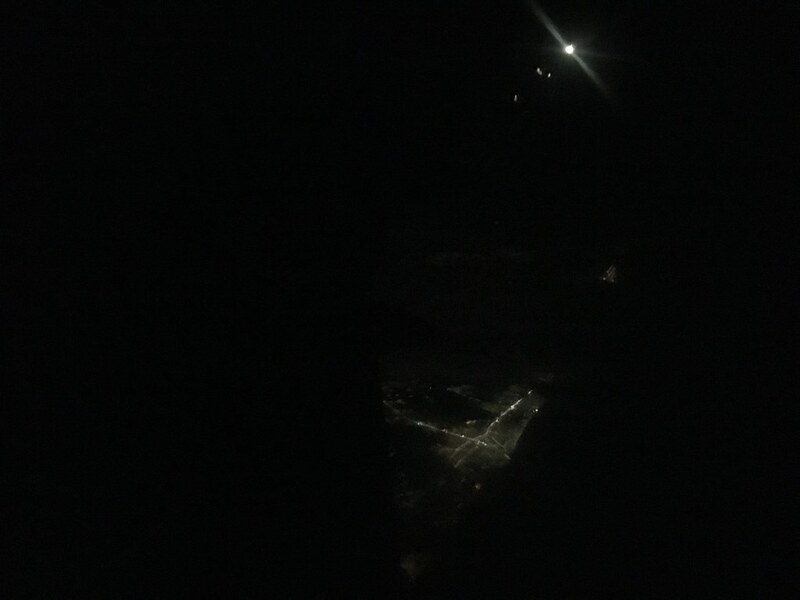 There was some congestion over Mumbai, and we were put in a holding pattern on at least two occasions. 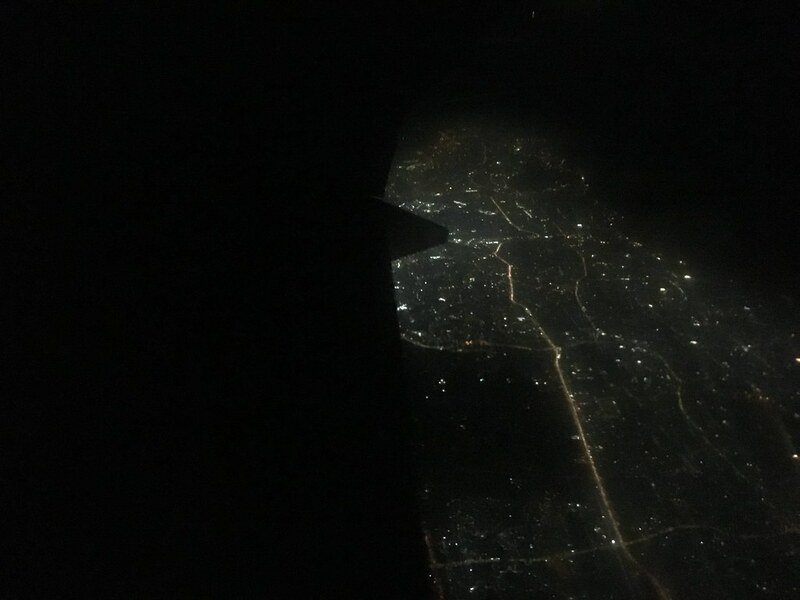 We entered the Indian mainland north of Mumbai after a brief hold over the Arabian Sea, flew east for a while before turning west for a landing on the main runway at CSIA. 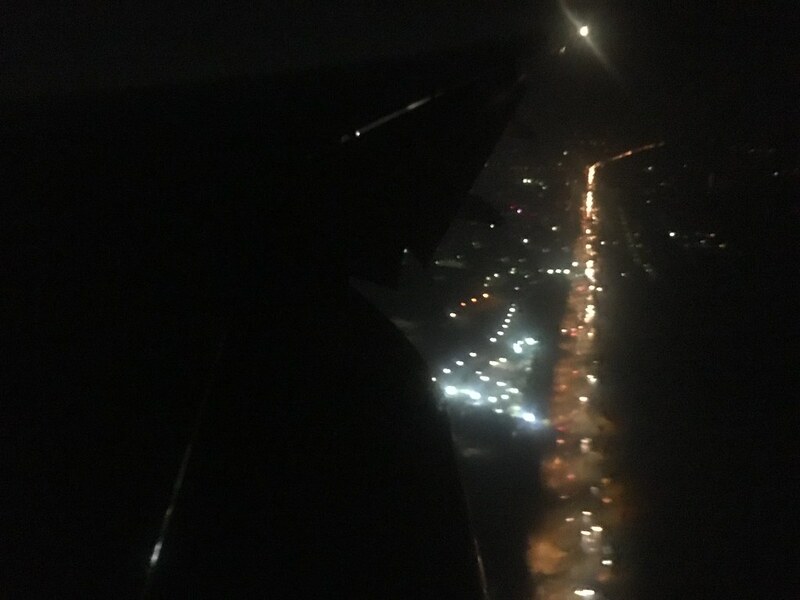 The weather in Mumbai was good, and the approach into India's commercial capital was very smooth. 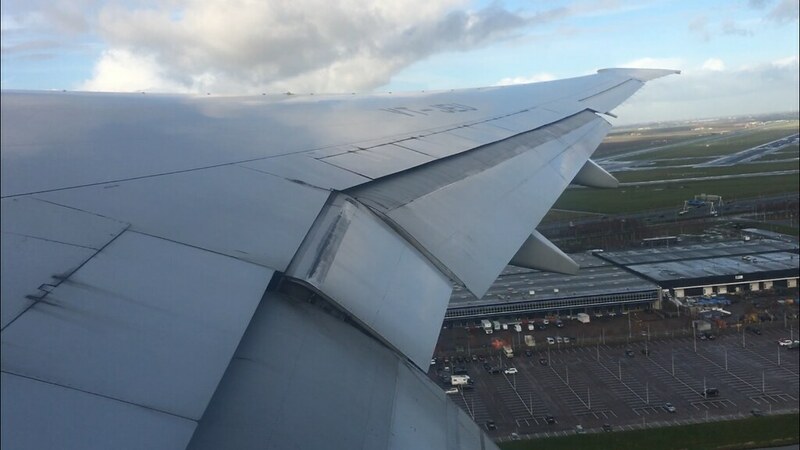 With landing gear and flaps fully extended, the pilots executed a butter-smooth landing on Runway 27. 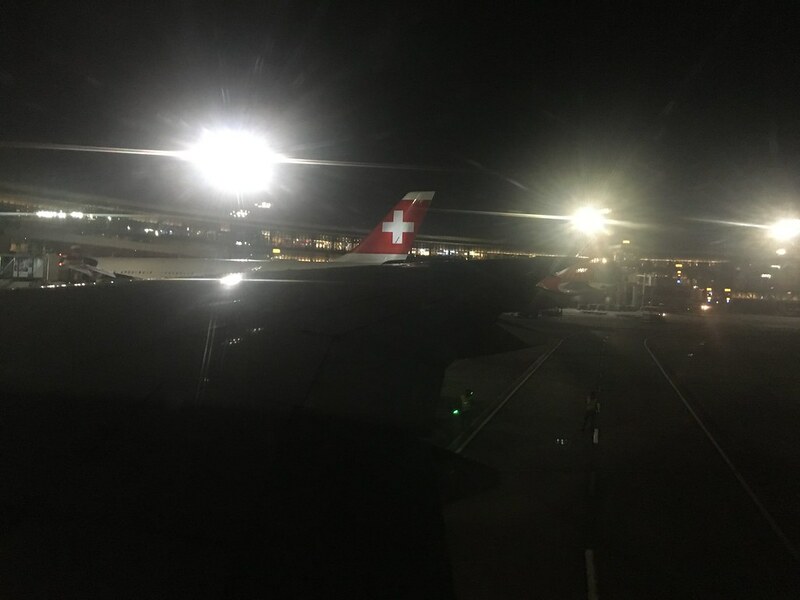 After touchdown, we taxied to Terminal 2 and docked next to a Swiss A330-300. Disembarkation was swift and I was in Mumbai's splendid T2 in no time. I had 2.5 hours to clear immigration, customs and security before my next flight to Bangalore. After a long walk, I found myself in a pretty crowded yet fast-moving immigration hall. My bags didn't take too long to arrive and I joined the long serpentine queue that had formed for Customs. Cabin bags are screened upon arrival in India at Customs, and once this formality was completed, I followed the signs that led me to the Domestic transfers counter at the Airport. Overall, a good flight with Jet Airways. The seats were cramped, but I think you should be fine if you manage to land an aisle seat. The cabin crew were excellent; pleasant in their service and demeanor. 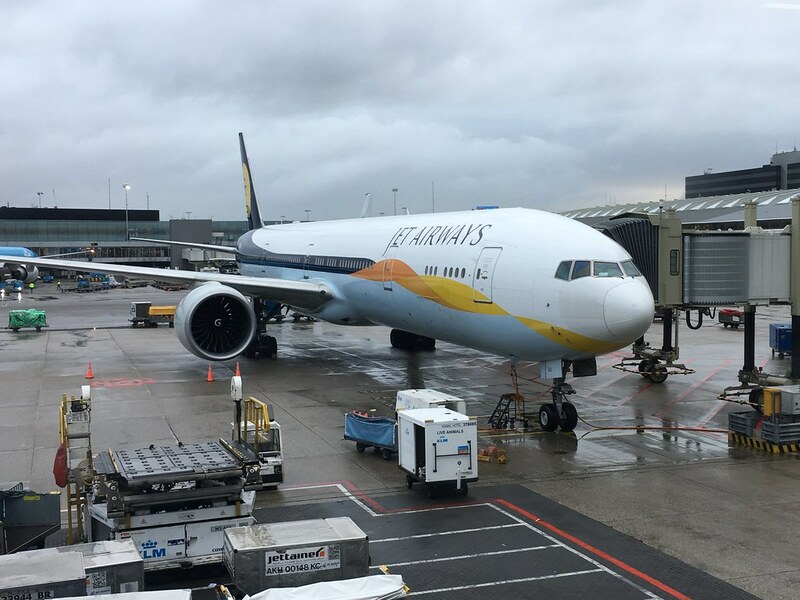 I really wouldn't mind flying Jet Airways from Amsterdam to India again, the service onboard was very good and the connection in Amsterdam was very convenient. 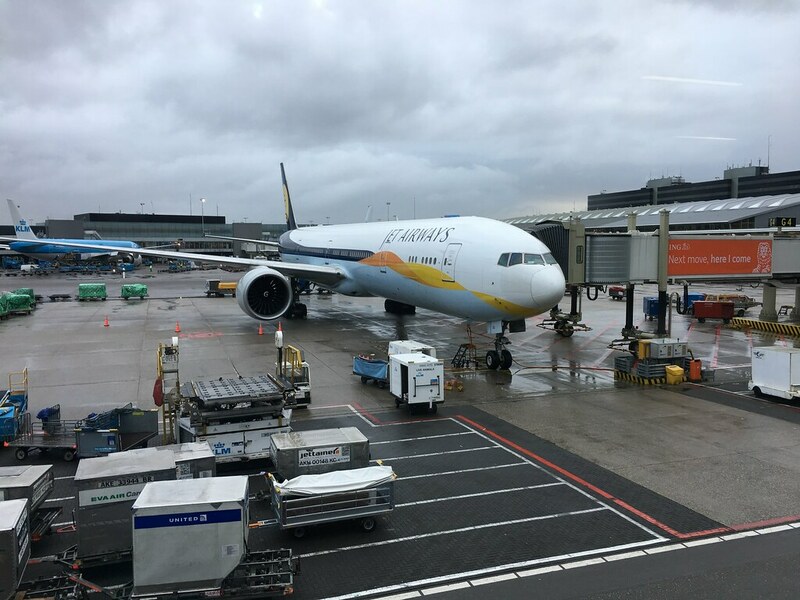 I was now looking forward to the last leg to BLR, my first flight on the Boeing 737 MAX 8. My apologies for the lack of pictures in Mumbai, the Airport was crowded, this was my first time in this Terminal and I was tired. I shall try and make up in Part 3. I hope you enjoyed this one! What a delightful TR, Ananth! 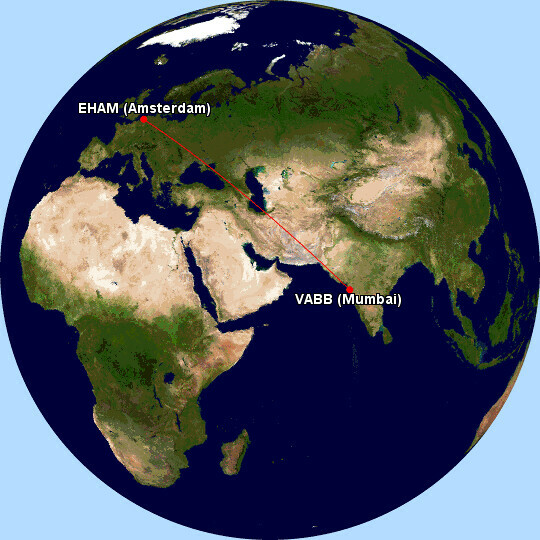 I have always wanted to read about some recent Jet longhaul experiences. Their B77Ws had the best hardware around when they were new. I guess things haven't gone that much downhill. Growling stomach owing to Delta's sparse food: quite understandable. I also understand that being a vegetarian, you were understandably apprehensive about having food which may not be according to your dietary preferences. The food looks good: the main course, at least. Bombay Brasserie is knwon for good food. I eagerly look forward to Part 3!